Given the relatively dismal performance of Lively, Google’s short lived browser-based virtual world, you’d think that smaller startups might be a little hesitant to jump into the space. But Canadian-based Leap In Entertainment thinks it can do what Google couldn’t, and has just launched a brand new virtual world that might actually stand a chance. Just Leap In (JLI) is a new browser-based virtual world that opens today in public beta. The company’s creative director, Michael Griffin, is quick to acknowledge Lively’s failure, but says that Google positioned Lively towards a younger demographic that is already saturated with other virtual worlds. JLI is going in a different direction, with graphics and an atmosphere that targets the 18-34 audience – a group Griffin says has more early adopters, which may help the company get over the initial hump that accompanies the launch of most virtual worlds. The world itself is impressive, sporting 3D graphics and a semi-realistic physics engine (they may not be quite as good as modern 3D games, but for a browser-based world they more than suffice). 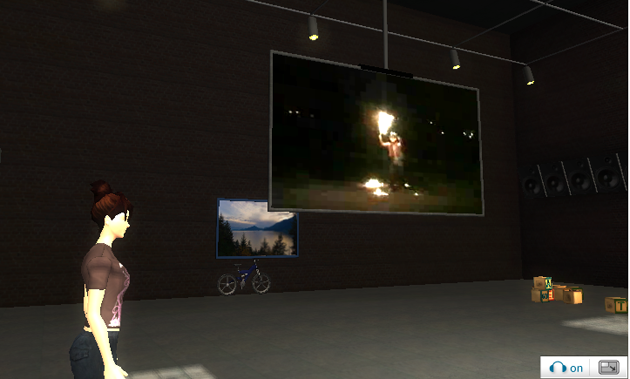 The game has strong support for multimedia, allowing users to drag and drop their own photos to create in-game art galleries, play live video from in-game screens, and stream their own music. Users can also syndicate their in-game activites to news feeds around the web. I also like the way the game handles friends. Every user can create their own room, which they can spruce up with in-game furniture, multimedia, and so on. Inside of these rooms you can add doors that link you to your friends’ rooms, allowing you to virtually walk through your social graph. For now you’ll have to manually add these ‘friend doors’ yourself, but in the future you’ll be able to important your social graph using Facebook Connect and eventually OpenSocial. The game supports both Mac and Windows at launch (something else Lively didn’t have), and is played through the browser after installing a small plugin. For now it is free to play and ad-free, with plans to eventually implement some subscription fees for premium features as well as a virtual goods store. Just Leap In will face competition from a number of other virtual worlds, ranging from full-on downloadable clients like Second Life to 3D chatrooms like Club Cooee, which we recently covered.